Today I'm catching up and posting a couple official blog tour stops and a few rebels. See below for linkage! Seems my UK readers really really like me! INSIDE OUT has been short listed for the Coventry Inspiration Book Awards in the The Read It Or Else! Category. YAY!!! The UK Office is on Fire! Here's the post about the MIZZ contest: Maria V. Snyder has teamed up with top teen mag Mizz to offer you the chance to WIN AN IPAD and become MizzMagTV’s official book reviewer of 2012! All you need to do is create a video review of her fantastic new book TOUCH OF POWER, and even better, MIRA Ink are giving away 50 review copies for free to get you started. TOP Blog Tour - It's all over the Internet! That's how it feels to me - I've done so many interviews, guest blogs, and reviews have been posted all over the blogosphere (99 % postive - yay!) that I feel a bit over-exposed! The UK office is kicking off a blog tour for TOUCH OF POWER this week! They are offering a Kindle stuffed full of books for the GRAND PRIZE and many copies of the book at each blog site. Only UK readers can win the Kindle, but each blog will have a contest and set the rules of who can win. 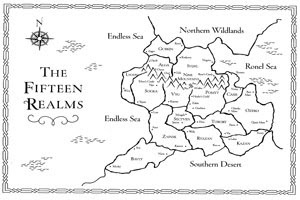 TOP Blog Tour - Map Quest! Other news - the UK blog tour will be starting on Tuesday, January 9, 2012 and I'll post all the links soon! I went skiing last night for the first time since last March - my legs are killing me! Another great review and contest to win a copy of TOUCH OF POWER for my official blog tour. Today Two Chicks on Books (so cute!) has posted a spoiler-free review and offers a chance to win. This isn't quite a Rebel Blog as it's RT BOOK REVIEWS! I was asked to be a guest on their blog today and write about the inspiration for Avry's healing powers. Also - this month I'll be traveling around Pennsylvania and New Jersey for a number of book signings. The official blog tour is back in action this week, starting with Live to Read blog. 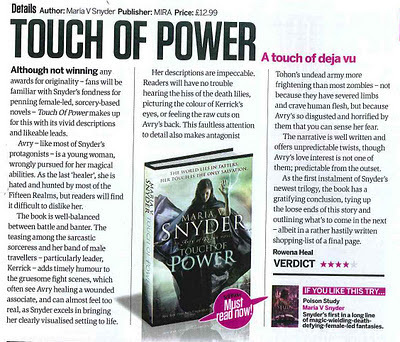 Krystal posted a wonderful review about the book (no spoilers), and is giving away a copy of TOUCH OF POWER.